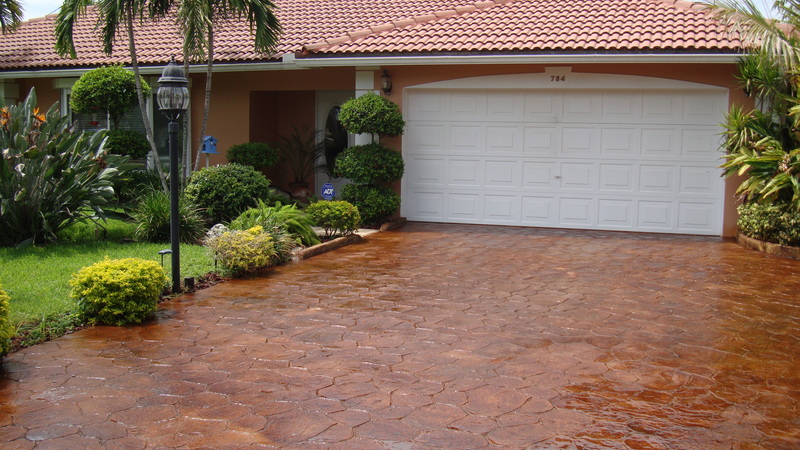 Stamped concrete can give a beautiful appearance to a home or driveway. The rougher appearance of stamped concrete can be used to mimic stone or brick and gives an elegant look to a home’s interior or exterior. However, you might want to add some color to your stamped concrete. A common question that we get at Concrete Camouflage is: “Can I stain stamped concrete?”. The short answer is: yes, you absolutely can. The next thing to answer is “how do I do it?” Below, we will walk you through how to stain stamped concrete. You can stain new stamped concrete before it has been sealed, with no problem. Before acid staining, you will want to wait until your stamped concrete is either 28 days old or has cured to one uniform color (whichever comes first). The process of staining stamped concrete is the same as any other concrete: clean and prep your stamped concrete, apply the stain, neutralize the stain, and apply concrete sealer and concrete floor wax once the acid stain has dried. Any of our concrete acid stains will do wonders on your stamped concrete and give the concrete a stunning natural color. Using stained stamped concrete, you can give the appearance of wood or stone. Another common question that we get is: “Can I stain older stamped concrete and how is the process different?” Again, the short answer is yes. We will walk you through staining older stamped and stained concrete how to make stamped concrete look like new. For older stamped concrete, you are going to want to check if the concrete has been previously sealed. If you are not sure if your stamped concrete has been sealed or not, you can test this by pouring a little water onto the concrete. If the water soaks in, you are good to start the concrete staining process. If the water beads up or sits on top of the concrete, you will need to strip off the sealer. You can’t acid stain the concrete until the sealer has been removed. The process for removing concrete sealer is pour on Xylene, also known as Xylol or Touline, and scrub with a stiff straw brush. Then use a painter’s shield to scrape the sealer into a pile and remove with a square point shovel. Then pour a little more Xylene on and repeat. If outdoors, you can power wash the sealer off of the edge of the stamped concrete. After stripping the sealer, you should take a look to see if there are any large cracks in your stamped concrete. If there are any major cracks, you can make the decision to either patch the cracks or leave the imperfection to give your concrete a little more character. If you needed to strip the sealer off of your sealed concrete, make sure that the stamped concrete is completely dry before proceeding with the acid staining process to get the best results. After this, follow the steps outlined above and in our guide to easily acid stain your old stamped concrete and reseal it. This new stain will give old concrete a beautiful look and is a great way of restoring color to stamped concrete and to refresh older stamped concrete. 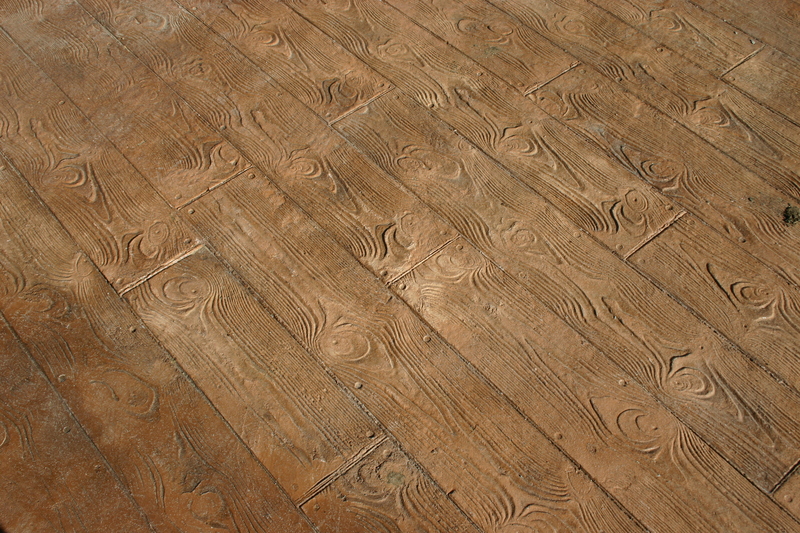 For your choices in stained concrete colors, check out our list of artist grade stain colors. If you have any further questions about staining stamped concrete, how to remove sealer from the concrete, specific questions about stained and stamped concrete, or just general questions about acid staining or concrete design, feel free to shoot us a message. We love to answer questions and help you get the best results out of your concrete acid stain.